Going grocery store shopping with kids can be no joke, especially when they start asking for everything in every aisle. Teaching kids life skills while also setting some simple ground rules can help make your shopping trips much smoother for you and for them. Keep your sanity with these positive parenting tips to help make your grocery shopping trips into teaching opportunities. *This post may contain affiliate links to products we love. For more information about affiliate products check out our disclosure policy. My kid knows most of the grocery stores around here have free bananas and oranges for kids. She also looks hard for those extra fruit samples in the produce department, and for samples when we go to Costco. Surprise samples are an extra bonus, and I encourage my daughter to try new things even if it’s not an item I would typically buy. We have never made it a thing that she could regularly ask for a cookie or sweets from the bakery as many stores offer them to kids. If someone in the bakery offers I’ll let her have it. If no one offers directly “they must not have that sample today.” This meant even now my daughter looks for the bananas but knows the bakery samples come and go. I can not say enough good things about taking my daughter to a farmer’s market. It always feels like the trip is a little extra special. Some of our favorite conversations about where food comes from and shopping seasonally have come from shopping at farmer’s markets. We also frequent farm stands and farms and talk about what’s available to us both locally and seasonally and where food comes from. A trip to the #pumpkinpatch is a blast, especially where we live the pumpkins are giant and plentiful! We visit farms often to help teach the kiddo that food has to be grown and harvested, and it takes hard work! But let's be honest, a day spent #pumpkinpicking is a lot of fun too! I've been sharing some of my favorite pumpkin painting ideas over on my Facebook page (see the link in my profile to join @onmykidsplate ) but I still can't decide what to carve or paint! I'd love to hear your ideas, what should we make our pumpkin into this year? Sometimes kids think we can just put anything in the cart, and to them, it seems totally possible. Explain the difference between needs and wants. Time in the grocery store is always a great time to look at labels and point out differences in different foods. Also, point out that many fresh products don’t have food labels because they aren’t processed. One of our favorite one ingredient lunchbox items (and snacks too) is hard-boiled eggs, but they can sometimes be hard to peel. This food took my kiddo more then once before she started eatting them, but now is a staple in our house. Check out my tips of how to pick the right eggs, and how to make hard boiled eggs so they are easy to peel. Cereal made out of cookies? Oatmeal that tastes like cake? Chances are if it sounds like a dessert, it IS a dessert. Teach kids about advertising and how some foods are tricky and really desserts disguised as meals. My own child would get a kick out of calling out tricky foods when she would find them. Most of the time this doesn’t mean I just hand the grocery list to my child. Oh, I learned that lesson the hard when she dropped it in a puddle of something. But you can turn it into a grocery game. “We need onions, can you help me find the onions?” Not only is it something fun for them to do, but it also helps to build their vocabulary. Kids also make great baggers for things that aren’t breakable. It’s a great time to help reinforce bringing your own grocery bags too. Have you tried using reusable bags like these that sit on top of your cart before? You can use one or all three at once. We have these Piavi grocery bags I was gifted a long time ago but last I checked they aren’t available anymore. These reusable grocery bags are similar including how they sit on top of the cart, and they also have an insulated bag. (great for cold and frozen items!) They are especially helpful for Costco trips, but we use them all the time. I can’t tell you how many times I place an orange, a container of berries, or a pear in my kid’s hands and had her take a big whiff. Smell that pear? It’s a good one, it smells delicious, doesn’t it? See these zucchini? We like the zucchini that are smaller when we can find them because they have fewer seeds which work better when we sautee them on the side. These bananas are a little browner, they are going to be ready for banana bread in just a few days. Can we find some that are more yellow? That apple has a bruise here, let’s see if we can find one without. Whether it’s trying a new vegetable or helping choose what’s for dinner, kids feel empowered when you let them help. Often I would give my daughter choices between two or three things based on what looked fresh and inspiring. This can also be a great step towards helping stop picky eating. Playing grocery store games can be an effective way to keep both your kids happy and busy and learning while you shop. Here are a few simple grocery store games you can play on the fly. Simon Says- In this classic game, kids do whatever Simon Says. If Simon does not say, then the other people get a point or maybe you just have a giggle if you don’t want to add points. Eye Spy- This is another easy grocery game to play on the fly. One person starts by saying “eye spy something…” Then picks a color or another descriptive word such as big, bumpy, red, smooth, etc.” Everyone else keeps guessing what it is until it’s finally guessed currently. Supermarket Sweeps– Look at your list with the kids and figure out how long you think it will take to put everything in the cart. Put a timer on your phone for that time and have kids monitor the timer to see if you can get it all done together. Point out how their help speeds up the shopping, and have them help to look for items before the timer runs out. Maybe everyone gets a special treat if you beat the clock with your shopping! Give me your old, your worn and your end of the week fruit! I keep a bag in the freezer just for the over ripe fruit at the end of the week that we didn't quite make it too. It doesn't matter if it's ugly, most fruit you can chop off a bruise as long as it's not bad when you cut into it or moldy. This week we were gone all weekend on the run so I have a little more to add to my bag then normal. This is about half of what I'm adding to this bag today on the cutting board. I also have a couple of handfuls of berries that are headed into the bag. The good news is this fruit gets new life when frozen and blended in a blender. You can pour it into popsicle molds or drink it as a smoothie after blending. I also keep a bag (sometimes two!) for frozen bananas. I keen them separate because bananas also get turned into banana muffins, yum! Do you have any tricks you use to give new life to worn out fruits or vegetables at the end of the week so they don't hit the trash can? Teaching kids how to use coupons can be helpful. Remember also to explain to them that if you weren’t planning on buying that food you’re not actually saving money. You weren’t going to buy it anyways! 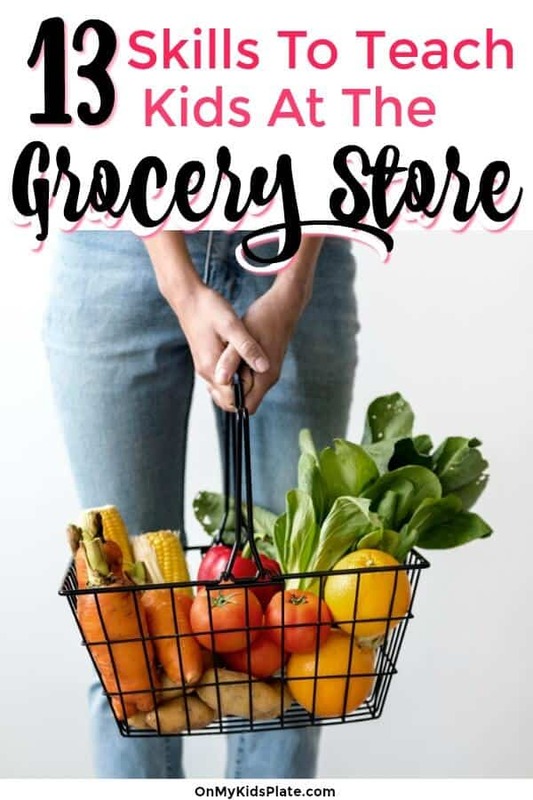 Departments in grocery store vary but include produce, deli, meat and butcher counter, seafood, dairy, bakery, frozen foods, pharmacy, and sometimes a seperate section for natural foods. The grocery store is a great time for kids to learn about social skills. It’s a great place to practice asking for help, interacting with all kinds of people, and being polite. Some grocery stores have mini carts that kids can feel like they are shopping too. Using this totally depends on your child’s temperament and how big of a shopping trip you have. I’ve found allowing my daughter to be in charge of a mini cart worked best for us when we just had a few items to pick up and she can take the lead. So have you done anything else when grocery shopping with your kids to keep them happy and make the trip go smoother? Which ideas of these have you tried? Tell me about it in the comment below!